KUALA LUMPUR: Vienna, the capital of Austria, has replaced Melbourne, Australia as the most liveable city in the world in 2018. Melbourne was “dethroned” to second place after seven consecutive years at the top. The Economist Intelligence Unit’s (EIU) Global Liveability Index 2018 ranked 140 cities globally. “Vienna has succeeded in displacing Melbourne from the top spot, ending a record seven consecutive years at the head of the survey for the Australian city,” the research and analysis division of The Economist Group said in its overview of this year’s rankings. The EIU noted that although both Melbourne and Vienna have registered improvements in liveability over the last six months, Vienna’s rise in ratings, especially in the stability category had been enough for the city to overtake Melbourne. Two other top-ranked Australian cities were Sydney (5th) and Adelaide (10th), while only one other European city made the top ten namely Copenhagen in Denmark taking 9th place, after its score increased by 3.3 percentage points from the last survey cycle. Also among the top-ranked cities are two in Japan — Osaka in 3rd place and Tokyo in joint 7th with Toronto. “Osaka stands out especially, having climbed six positions, to third place, over the past six months, closing the gap with Melbourne. Osaka’s improvements in scores for quality and availability of public transportation, as well as a consistent decline in crime rates, have contributed to higher ratings in the infrastructure and stability categories respectively,” EIU said. The rest of the three top-ranked cities are all in Canada — Toronto (joint 7th with Tokyo), Calgary (4th) and Vancouver (6th). EIU highlighted that the ranking movements do not necessarily arise from a change in liveability in the cities themselves, but reflect how cities compare with one another. For example, although four cities have fallen from the top ten over the past year — Auckland (from 8th to 12th), Perth (from 7th to 14th), Helsinki (from 9th to 16th) and Hamburg (from 10th to 18th) — none of these have seen a fall in their overall scores during this period. EIU also highlighted that stability has significantly increased by 2.5% overall. “This trend reflects positive developments in this category, despite threats of terrorism and unrest that cities around the world continue to grapple with. 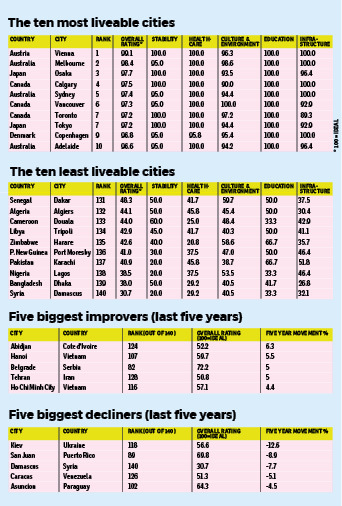 Only 10 cities have registered a decline in their liveability ratings over the past six months, largely reflecting an impact on cultural and environmental indicators,” the report showed. Of the poorer-scoring cities, 11 occupy the very bottom tier of liveability, where ratings fall below 50% and most aspects of living are severely restricted. Damascus, Syria has seen a stabilisation in its dramatic decline in liveability but remains ranked at the bottom of the 140 cities surveyed, with a liveability score that is 7.3% lower than the second lowest-ranking city in the survey, Dhaka in Bangladesh. “The relatively small number of cities in the bottom tier of liveability partly reflects the intended scope of the ranking — the survey is designed to address a range of cities or business centres that people might want to live in or visit. For example, the survey does not include locations such as Kabul in Afghanistan or Baghdad in Iraq,” EIU said. This story first appeared in the EdgeProp.my pullout on Aug 17, 2018. Download EdgeProp.my pullout here for free.